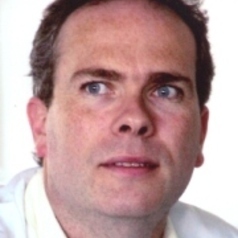 Richard Faragher is Professor of Biogerontology at the University of Brighton and is past Chair of both the British Society for Research on Ageing and the International Association of Biomedical Gerontology. He read Biochemistry at Imperial College, London and undertook doctoral studies at the University of Sussex. His primary research interest is the relationship between cellular senescence and organismal ageing. In 2002 his work on the accelerated ageing disease Werner’s syndrome led to the award of the Royal Pharmaceutical Society Conference Science Medal for outstanding scientific achievement. In 2005 he became the first ever scientist to receive a Help the Aged award for his championship of older people and the use of research for their benefit. In 2010, he became the first ever British recipient of the Paul F Glenn Award for research into the biological mechanisms of the ageing process. He is a visiting Professor at the Moscow Institute of Physics and Technology. He has served on the Editorial Boards of ‘Aging Cell’, ‘Mechanisms of Aging and Development’ and ‘Age’. Professor Faragher has served as a member of the Research Advisory Council of the Charity Research into Ageing and on strategy and funding panels for the BBSRC, the US National Institutes on Ageing and the European Union. From 2005-2008 he was Co-director of the BBSRC-EPSRC SPARC programme, a research network designed to build national capacity to conduct inter-disciplinary ageing research. He has Chaired the Scientific Advisory Board of the British Society for Research on Ageing and served as a member of the Board of Directors of the American Aging Association. From 2015-2017 he was president of the latter society. He is the first British citizen to be elected to the Board of Directors of the American Federation for Aging Research, the leading US non-profit organization supporting and advancing healthy aging through biomedical research. In 2016 he was awarded the UKs highest honour in the biology of ageing, the Lord Cohen of Birkenhead Medal.